We just picked up our two hogs worth of pork from the processor this week! Many of you have told us how you have been waiting for us to have pork in stock again. So we are happy to make the announcement today that we will have all of our pork products for sale this Saturday during our farm store hours (9am-1pm). As a thank you to our customers for waiting so long for us to harvest these hogs we are offering a special “Pork Lovers Package”. 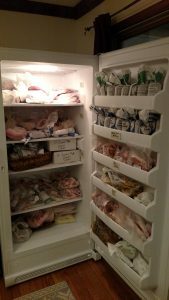 The package includes 10+ lbs of pork products like ham, ham steaks, sausage, and chops for a 25% discount off the retail cut price! But hurry into the farm store, as there is a very limited quantity of these packages available! Below is a complete list of our pork products, you can see prices on our How To Buy page. We hope to see you soon and send you home with some delicious pork!